Beyond the work of the organized GOP, there&apos;s concern that intimidating on-the-ground tactics from Trump supporters may also be keeping minorities from the polls. Some of the deficit could still be made up on Election Day. But if it isn&apos;t, it could cost Hillary Clinton and Democratic Senate candidate Deborah Ross in a pivotal state where minority voters are crucial to Democratic hopes. 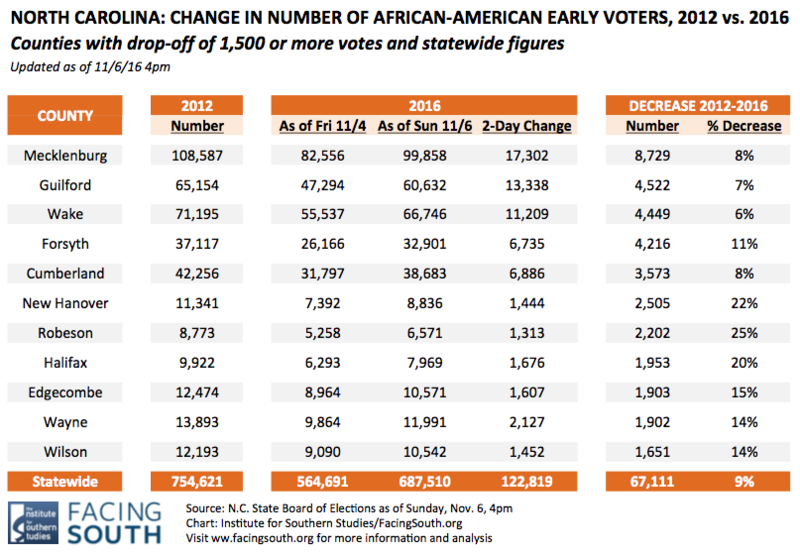 Two other factors that may have contributed to the voting drop-off: Some of the largest declines were in Cumberland and Robeson counties, both of which were hit hard by Hurricane Matthew. Some residents of the state&apos;s coastal areas are still getting back on their feet. And Republicans eliminated straight-ticket voting, a time-saving device which allows a voter to select a party&apos;s entire slate of candidates by hitting one button. Over half of all voters used straight-ticket voting in 2012, and it was especially popular with African-Americans. It&apos;s loss is likely to have caused longer wait time to vote.